Mood: SHOCKED-The best brussel sprouts you will ever have! Last year for Husband”s birthday, I planned a surprise dinner with friends at this really awesome restaurant called ‘The Commissiary’ which is a restaurant in East Vancouver that was started by the owners of the ‘Tacofino’ Food Truck. Tacofino is a taco food truck that started in Tofino BC on Vancouver Island. They have some amazing tacos (and you all know how my family feels about Tacos, I mean sheesh, the lion has a taco chant) and some unique items such as the diablo cookie which is a spicy chocolate cookie. I was super stoked when they opened up an actual restaurant so husband’s birthday was the perfect opportunity to go. So there was about 10 of us there and everyone ordered different variations of tacos and sides and growlers of beer and we sat at this long table and it was a really top night. So simple, low key and a great atmosphere for people to hang out and shoot the breeze. One of my good friends Rachel ordered a side of brussel sprouts and I was suddenly became infuriated. It was almost as though she was about to wreck everyone’s party by ordering an old person vegetable and I just could not for the life of me understand why anyone who was out for a night of drinking with friends would order brussel sprouts. What the hell was she thinking?? Well…didn’t I feel like the biggest schmuk when they arrived and she was going goo goo gah gah over them. She offered me one and kept saying ‘just try one, seriously’ and it was like I was being challenged to a contest on Fear Factor so I took it and SWEET MOTHER OF PEARL they were FLIPPIN’ DELICIOUS!! I suddenly felt like I had been ripped off for 30 plus years because I had no idea they were that good. I would imagine this is exactly how husband felt when he realized that Pecan Pie was really just a big butter tart. For several weeks after, I could not stop thinking about those brussel sprouts and decided I would try and recreate my own version inspired by that night with friends. I wanted to bring back that feeling of complete shock and excitement. The excitement of discovering a food that had been completely reinvented in that one second where I got told to ‘just try one’, I had no idea that brussel sprouts, the vegetable I always passed up at every holiday could be so damn amazing. I went out and bought some at the market and then just had to try my best to remember that feeling, those flavours and add my own creative spin on it. This is what they will look like after being sautee’d for a while and adding the lime zest in to the pan. 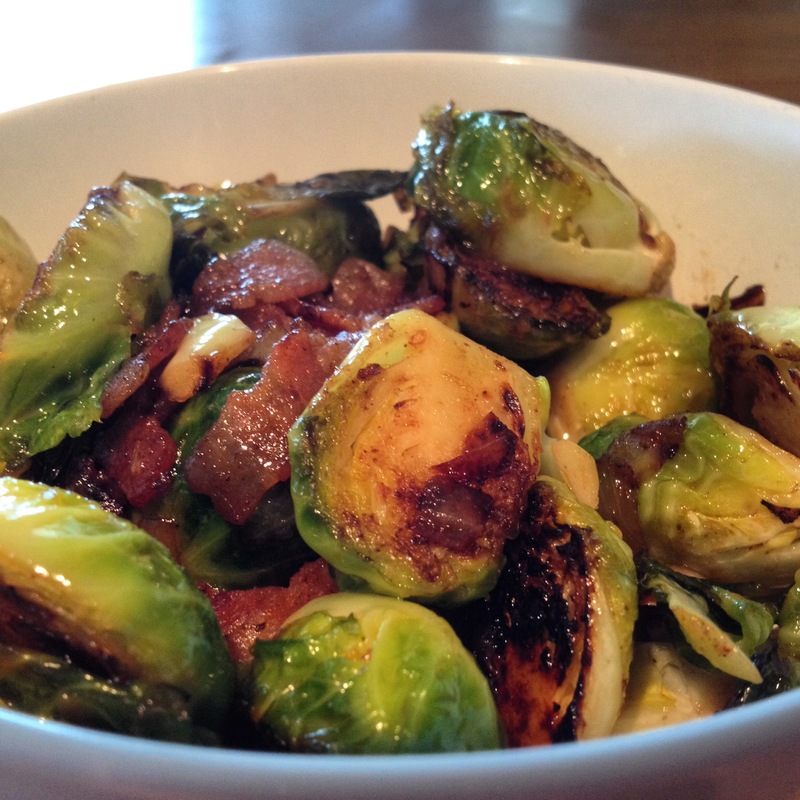 Once the bacon is a bit brown, add the halved brussel sprouts and sautee for a few more minutes with the bacon and onion. Add a few dashes of ancho chilli powder and a bit of chipotle powder for some heat and a bit of bite (you can always add more later depending on taste but don’t go too hot too early). 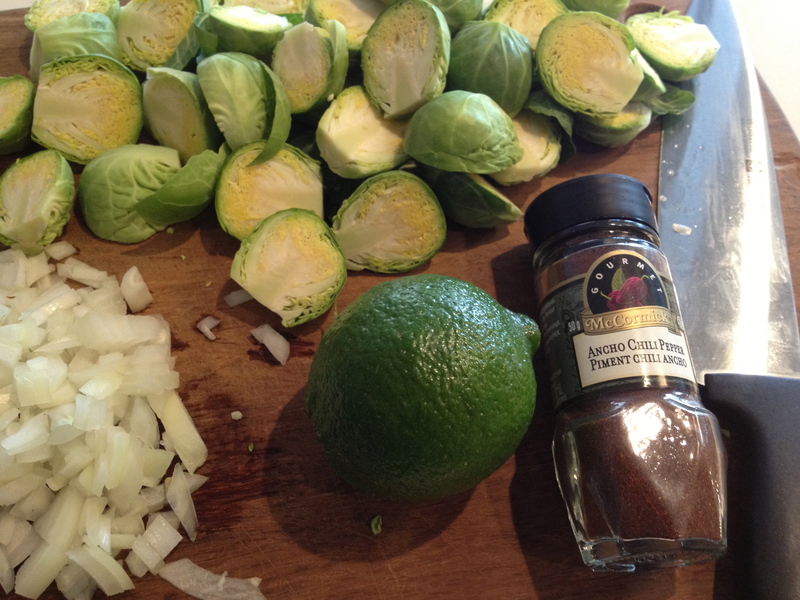 Add a bit more lime juice and add the lid to the skillet to let the brussel sprouts steam for a few minutes (not too long or they will get mushy, I like mine to have a bit of crunch). 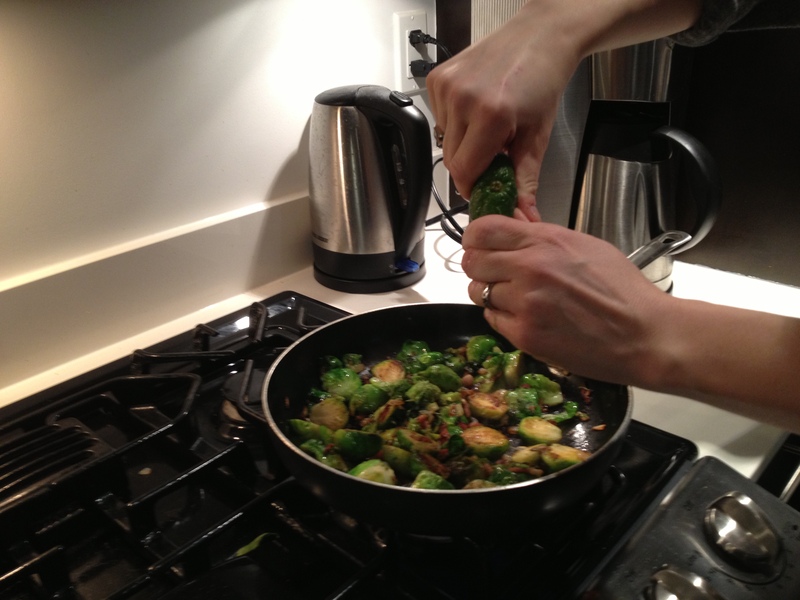 Once they are done and you can put a fork through each brussel easily enough, squeeze a bit of honey in to the pan and stir. 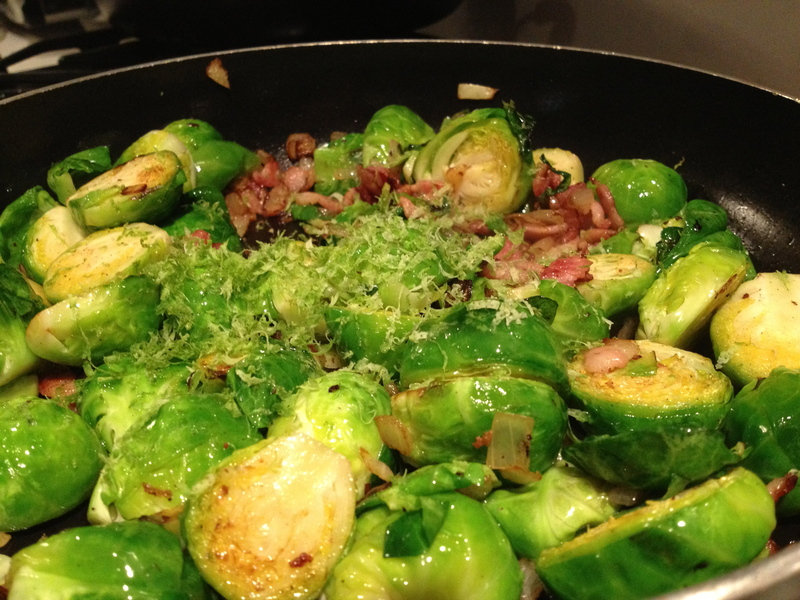 This will start to glaze the sprouts. If you are feeling extra special, once you put the brussel sprouts in to the dish, grate some cotija cheese overtop…NEXT LEVEL!!! Here is what the dish will look like before you devour it!! I could eat a bowl of this for dinner every week. The dish that is pictured here does not have the cheese on top cuz well…I didn’t have it on hand. Ordering an old person vegetable Rachel! Haha love it!